Brit/Pak boxer Amir Khan a.k.a King Khan will be set in ring with Peterson, the current IBF and WBF title holder on March31st 2012 in a rematch. 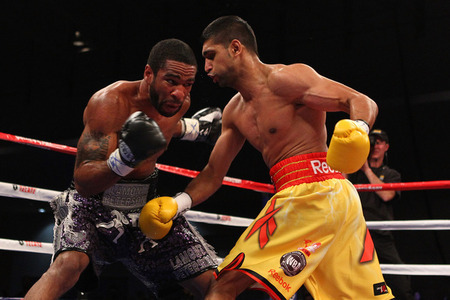 Amir Khan lost to Peterson last weekend losing both his titles on a split decision by the judges. Amir Khan was of the view the referee(Cooper) was not being fair, ultimately deducting two points for pushing without warning. According to Khan he was ultimately playing with two people in the ring, Peterson and the referee. Amir Khan after the match readily demanded for the rematch. Khan's Hall of Fame trainer, Freddie Roach, didn't hold back in his criticism of Cooper, who declined to talk after the fight. "(Cooper) did a terrible job. A referee shouldn't decide fights," Roach said. "He's not a judge. He made himself a judge tonight. He missed a knockdown. The first knockdown (ruled a slip) was clearer than the second one. And then he took two points away for nothing and didn't give warnings. This is like amateur refereeing. A referee at this level of competition shouldn't make those mistakes. He decided the fight, not the judges. The referee took it out of the judges' hands."